This small family hotel is located in the ancient town of Nessebar with wonderful views overlooking the sea. Ancient Nessebar is the pearl of the South Coast of the Black Sea, offering very good weather conditions and facilities for a pleasant stay. The hotel is 400 m from the beach and Burgas Airport is about 25 km away. This small, air-conditioned, family-friendly hotel features 10 rooms in total, consisting of double rooms and apartments. 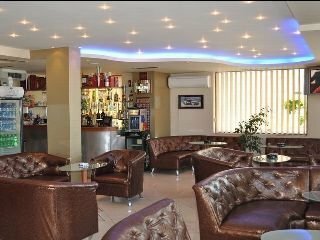 Guests are welcomed in the lobby, which offers a 24-hour check-out service, as well as a hotel safe and a lobby bar serving a variety of brand drinks and cocktails. Additional amenities include a café, a restaurant and Internet access. All rooms are en suite and feature a shower and a bath, as well as a double bed, satellite/cable TV and wireless Internet access. Additional amenities include a safe, a fridge, air conditioning, individually regulated heating and a balcony. On request the hotel organises trips to a Bulgarian village for wine tasting, car rentals, boat trips and any other pleasures. The nearby beach is sandy. Guests are served a continental breakfast each morning.